INCLUDING ANY EXTRAS YOU MAY WANT. Remember to Tip your Bartista. Please verify with your local Starbucks that they do indeed take 'Recovery Certificates'. 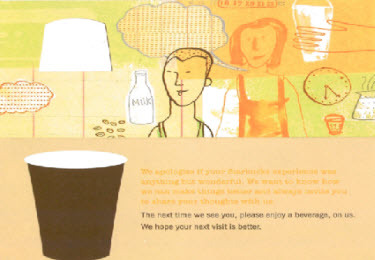 Many locations will not accept the Recovery Certificates and will give you a litany of reasons why - however a large percentage will accept them, so unless you do a lot of traveling with the opportunity to use them at many different places it is advisable to check with your local Starbucks before ordering.